Putting skincare on your face is so 2016. Banish dull, lifeless skin in the long term. 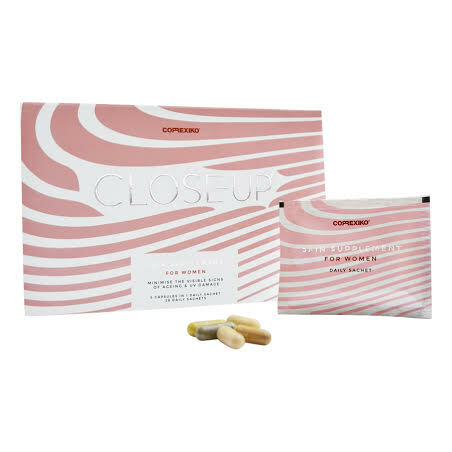 This skin supplement nourishes your skin from the inside - so it can heal and repair itself and you can ultimately enjoy softer, younger, prettier skin. Intensively nourish your skin from the inside, banishing a dull and lifeless complexion for good. The Correxiko Skin Supplement is formulated to give your body the building blocks to heal and repair itself. The Skin Supplement was created to help feed skin cells and provide the nutrients, antioxidants, minerals, and vitamins. These components make the difference between aging skin and younger looking skin. There isn’t any kind of diet in existence that provides all the nutrients, encased in the Skin Supplement’s capsules, every single day. CORREXIKO’s Skin Supplement lessens the results of cell aging over time; meaning that you protect your face, neck and body daily from the signs of aging in the years the come. What can you expect? You will start to see skin firmness, texture, glow and a lessening of fine lines and wrinkles within 12-18 weeks of consistent daily use, though benefits may be seen earlier, increased energy may be noticed from Day 3 onwards. The benefits of each sachet are enhanced by drinking a minimum of 2 litres of water daily. Enriching and protecting your body from the inside is a long term goal. For optimal results take for at least 12-18 weeks and benefits accumulate with long term use. If you feel unable to swallow capsules whole, Correxiko capsules can be opened and the ingredients inside can be sprinkled into juices, yogurt, smoothies, or over salads.